This is a limited edition Kiesza by Heck image created exclusively for Kiesza by world renowned Pop Artist Ed Heck. A portion of the proceeds will benefit ArtWorks Foundation and the Surprise!Supplies art carts program. Kiesza, singer/songwriter and pop polymath, shot to stardom in 2014 with the release of the Hideaway EP that topped the US and UK charts with the eponymous single holding over 133 M plays on Spotify and 35M on YouTube. Later that year, the Calgary-born artist released a full-length debut, Sound of a Woman via Island Records, which met both commercial and critical success. Since then Kiesza has gone on to win three Juno awards and has been nominated for the mtvU Woodie Awards, Germany’s Echo Awards, and the International Dance Music Awards. Her music has been featured in film and Broadway including her song “Cannonball” in Dreamwork’s animated film, Home, featuring Rihanna and “Stronger” which was the lead single off of Finding Neverland: The Album, Harvey Weinstein’s hit Broadway musical of the same name. Surprise!Supplies is a program that furthers the ArtWorks mission to maximize access to the arts for children and young adults suffering from chronic and/or life-threatening illnesses and their siblings. The goal of Surprise!Supplies is for these children, and their siblings who accompany them, to have their own kit of crafts to keep them busy creating while anticipating a long day in treatment, enduring an extended stay in the hospital or accompanying a sibling to a procedure. Ultimately Surprise!Supplies provides children with the means to unleash their creative energy which helps them cope with the challenges of stressful and painful hospital visits. ArtWorks’ priority is to make Surprise!Supplies a meaningful, effective and therapeutically valuable program. We work individually with each agency to determine which pediatric unit would benefit most from the program. Pediatric areas being served by Surprise!Supplies include Hemodialysis/Renal and Liver Clinics, Pediatric Intensive Care Units and Pediatric Oncology/Hematology Units. Each element of Surprise!Supplies is designed to make the program visible, accessible and user friendly. In addition to the assortment of art supplies and craft kits, ArtWorks provides a custom designed mobile Art Cart designed by Pop Artist Ed Heck, to store and transport these materials with ease. Each hospital also receives an ArtWorks Bulletin Board to place in the pediatric department to display patient’s paintings and drawings. Surprise!Supplies has launched more than 32 art carts in hospitals throughout the tri-state area. Each year this program helps thousands of children channel their feelings and energy through a host of creative outlets, inspiring confident and creative young people. For more information about ArtWorks and our programs, visit www.artworksfoundation.org or call 201-608-0146. 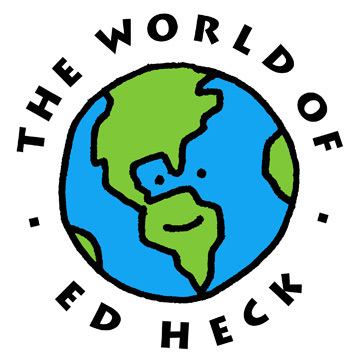 Ed Heck is a New York Pop Artist and children’s book author known internationally for his brightly colored whimsical works on canvas. His enigmatic canvases were first exhibited in New York City in 1999 and were an instant hit. Interest and demand continue to grow and his work can now be found in galleries around the world. Unique style and mass appeal have forged his reputation as one of the leading pop artists of our time.